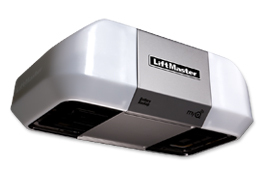 The LiftMaster® 8360 is a sturdy, highly-dependable garage door opener that provides extra security with a built-in battery backup system that enables the door to operate normally — with security and safety features intact — during any power outage. This model of door opener also features MyQ® equipment, which gives you the option of using your smartphone or computer to open and close your garage door and switch the lights on and off from any location in the world. “I had this opener professionally installed to work with a large (14′ x 7″), heavy (due to insulation) steel Clopay door. The 20-year old 1/2 horsepower opener this replaced served well, bit was laboring under the load and the years. This is door opener with many excellent features. In addition to the usual safety features and sensors, it comes equipped with both front and rear bulbs (each will accept up to 100 watt bulbs). The external keypad will lower the door without a keycode, and the interior lighting is motion sensitive; walk into the dark garage from the house, and no fumbling for the switch…just enjoy the light. The closing sequence takes longer than the opening sequence. By design, the door slows down as it nears its lower travel limit. Inside the house (attached to the garage) there is very little audible opener noise. If your old opener has seen better days, you’ll love the user experience of this model.